Prepare for Arizona's game against Texas Southern on Wednesday with Bruce Pascoe's in-depth scouting report. The series: In their only previous matchup, second-seeded Arizona took a 15-2 early lead and rode it to the end in a 93-72 win over 15th-seeded Texas Southern in an NCAA tournament opener in 2015. Rondae Hollis-Jefferson led the Wildcats with 23 points and 10 rebounds. Nobody plays a gutsier schedule in Division I relative to their resources than the Tigers, who play all of their nonconference games on the road and don’t shy away from high-major teams in an effort to build their RPI while locked into the low-major Southwestern Athletic Conference. So far, they’ve won or been competitive in all of their games, led by dynamic transfer guards Zach Lofton (Illinois State) and Dulani Robinson (Pacific) and post player Derrick Griffin, a versatile talent who was both a second-team all-conference football player as a wide receiver and the SWAC’s Player of the Year in basketball as a forward. This year, Griffin left football after suffering a minor injury and violating team rules but he’s nearly averaging a double-double in basketball. The Tigers run a lot of screens to get Lofton and Robinson shots, but each is quite capable of creating their own. TSU runs at a fast pace and play man-to-man offensively, but its talent does not run deep. Out of high school in suburban Houston, Griffin was a four-star recruit who committed to Texas A&M then signed with Miami (Fla.) – as a wide receiver/tight end in football. His unusual combination of size, athleticism and strength works pretty well on the basketball court, too. 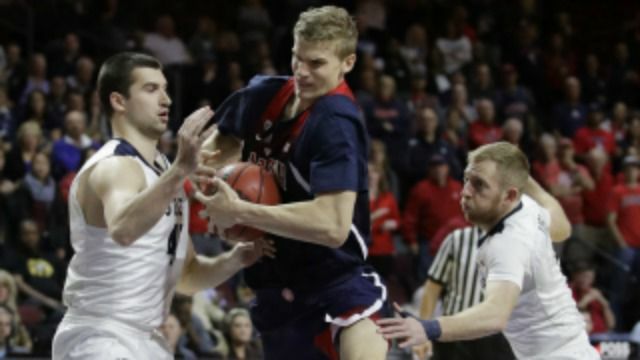 The junior point guard has brought Arizona stability at the point, with a 3.6-1 assist-turnover ratio, though the UA offensive broke down late in its loss to Butler last Friday. This time, he’ll have to deal with a frenetic and prolific Tiger backcourt. -- UA assistant coach Book Richardson, who scouted the Tigers. Just as the Wildcats were traveling to Las Vegas last Wednesday, forward Ray Smith was undergoing surgery for his torn ACL. While the ever-upbeat Smith rejoined the team at the Las Vegas Invitational afterward, that doesn’t mean everybody felt good about it. Smith has now suffered three ACL tears, prompting him to announce his retirement from basketball last month. “It was successful in that everything was repaired,” UA coach Sean Miller said. “But it was the worst of the three knee injuries he’s experienced. It’s almost astonishing to say that because everybody saw his injury this time and that was that he landed on a layup. He pretty much lost everything in his knee. Everything was torn. It’s hard to believe. It really is. Miller has said Smith will continue to be a part of the UA program through graduation, most likely in a graduate assistant-type role, as much as NCAA rules allow. The NCAA tournament may be the most pressure-filled part of the Wildcats’ season on the court, but nothing may compare to now in their off-court existence. Arizona players are finishing up fall semester classes while playing a total of five games and taking two road trips between now and the end of finals on Dec. 15. Texas Southern coach Mike Davis flatly says “we won’t win” Wednesday’s game, but he’s aiming to keep it close. 3: Of Arizona’s top three scorers who are freshmen. 7: Of Texas Southern’s top seven players who began their college careers at another school. 28.3: Shot attempts per game between Texas Southern guards Zach Lofton and Dulani Robinson.